We would like to say THANK YOU to everyone who purchases Moxie merchandise from the site, at the Museum, or when you see us out at community events. Please know that a portion of all purchases goes to support the ongoing running of the Museum. We are grateful for your support! Please note: Online prices include U.S. Shipping & Handling and any applicable Maine sales tax. 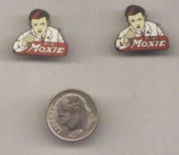 Original Moxie bottle cap earrings, various logos, priced per pair. Choice of New Moxie (red) bottle cap earrings, 50 years old, and Original Moxie (B&W) bottle cap earrings, 90 years old. Priced per pair. Sold individually. Shown with dime to indicate size. 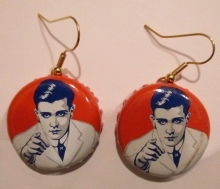 Moxie Boy bottle cap earrings, priced per pair.